Quantum theory also tells us that the world is not simply objective; somehow it's something more subtle than that. In some sense it is veiled from us, but it has a structure that we can understand. The remarkable insights that science affords us into the intelligible workings of the world cry out for an explanation more profound than that which itself can provide. Religion, if it is to take seriously its claim that the world is the creation of god, must be humble enough to learn from science what that world is actually like. The dialogue between them can only be mutually enriching. There is much cloudy unpredictable process throughout the whole of the physical world. It is a coherent possibility that God interacts with the history of creation by means of "information input" into its open physical process. The causal net of the universe is not drawn so tight as to exclude this possibility. Mere mechanism is dead, and a more subtle and supple universe is accessible to the providential interaction of the Creator. The test of a theory is its ability to cope with all the relevant phenomena, not its a priori 'reasonableness' The latter would have proved a poor guide in the development of science, which often makes progress by its encounter with the totally unexpected and initially extremely puzzling. Theology differs from science in many respects, because of its different subject matter, a personal God who cannot be put to the test in the way that the impersonal physical world can be subjected to experimental enquiry. Yet science and theology have this in common, that each can be, and should be defended as being investigations of what is, the search for increasing verisimilitude in our understanding of reality. Mathematics is the abstract key which turns the lock of the physical universe. God didn't produce a ready-made world. The Creator has done something cleverer than this, making a world able to make itself. God is not a God of the edges, with a vested interest in beginnings. God is the God of the whole show. The rational transparency and beauty of the universe are surely too remarkable to be treated as just happy accidents. 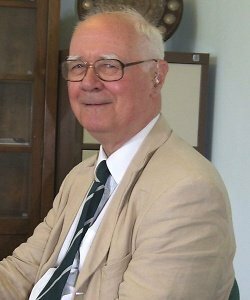 Bio: John Charlton Polkinghorne is an English theoretical physicist, theologian, writer and Anglican priest.